is the most complete and detailed fishing- information product currently offered by Captain Kev. 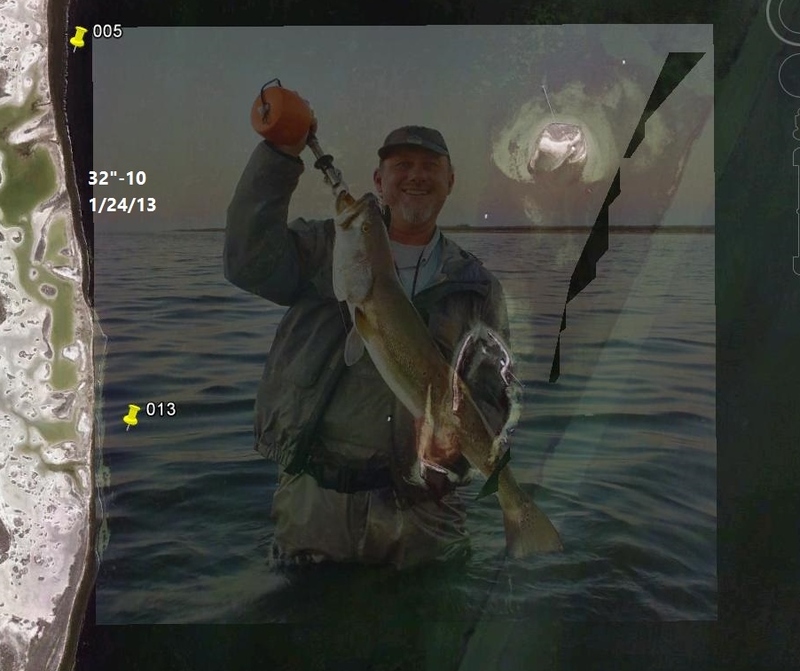 "This package includes a GPS data card with over 350 waypoints and tracklines, a DVD, spreadsheet and text document to help users understand how to use the data and a copy of Monster Maps and More, a book containing over 100 pages of graphics and text, documenting where Kev and his clients have caught trout over 27 inches throughout the area he fishes." This packet of materials can be ordered through the PayPal button below, by calling Kev at 361 688 3714, or by emailing him at kevxlr8@mygrande.net. All who wish to purchase the product should contact Kev first. The price of $999 listed for use with the PayPal button below includes cost + tax + shipping. To read more detailed information on this comprehensive package, click here. 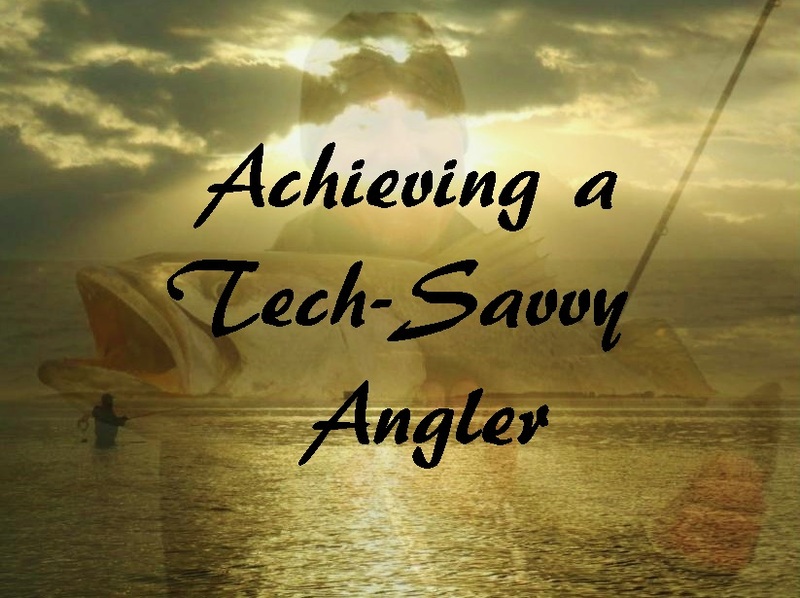 is a digital booklet intended to help the average angler better incorporate and use gadgets, devices and software which enhance angling productivity. "This document details the processes which best facilitate using a GPS, cell phone, personal computer and other devices to learn more about the waterways and make fishing safer, more fun and more productive. It includes a document with hyperlinks useful for downloading all sorts of programs and finding information about new technologies easily. Since this product documents something which evolves constantly, it is intended to change with the times. All who purchase it can ask for and receive updated versions repeatedly." This PDF file can be ordered through the PayPal button below, by calling Kev at 361 688 3714, or by emailing him at kevxlr8@mygrande.net. The price of $9.99 listed for use with the PayPal button below includes cost + tax. 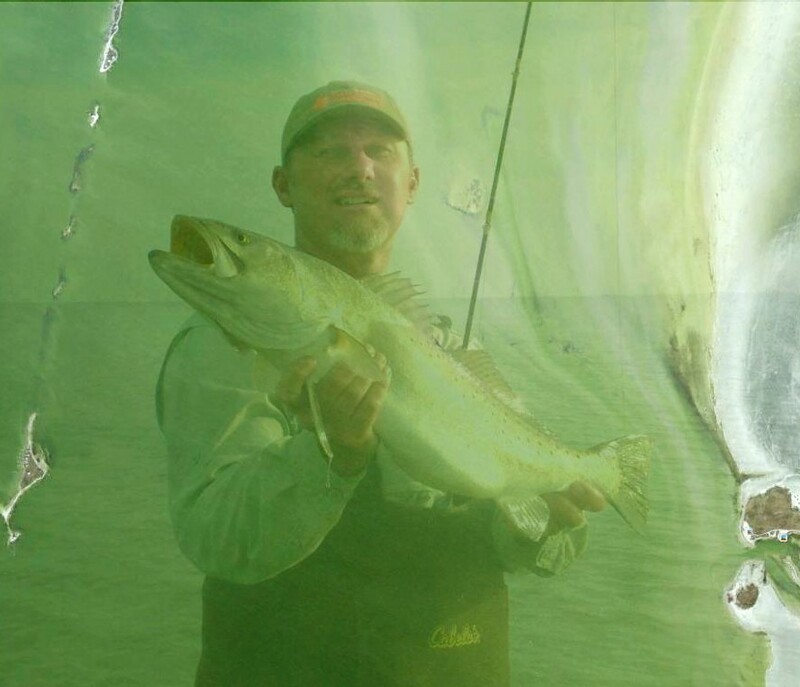 is a 134-page digital book which describes the basic edicts Captain Kev uses to make decisions on a daily basis while fishing for speckled trout with artificial lures. "I created this book to help people who possess a genuine desire to become better anglers streamline their processes and eliminate some common mistakes.... I stand behind the veracity and efficacy of these principles because I've spent so much time deploying and testing them." A basic list of the Sound Operating Principles used as an outline for this book appears at the end of the text. Price of $9.99 includes cost, tax and shipping/handling. is a precise, thorough and detailed 100+page book, including graphics and text which document the locations where Kev and his clients have caught hundreds of big trout throughout the Baffin/Upper Laguna Madre complex. "This book uses Google Earth images overlaid with text, GPS data and jpegs. I created it in 2011 and have updated it with loose pages every year since. It contains copious amounts of data I've accumulated over a decade and a half guiding clients on big-trout hunts. I consider it unique in its potential for helping someone improve their odds of catching trophy trout in this area." This book can be ordered with or without a seminar through the PayPal buttons below, by calling Kev at 361 688 3714, or by emailing him at kevxlr8@mygrande.net. The price of $499 listed with the PayPal button below includes cost of the book + tax + shipping.The price of $574 includes a four hour seminar with Kev in his home detailing how best to use the book. 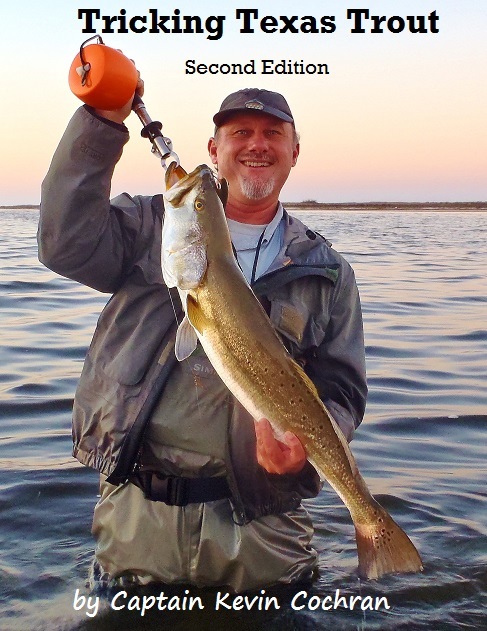 Tricking Texas Trout, Second Edition is a recently edited and updated version of the Captain's first book. It is a 111-page instructional digital book in which the author (narrator) discusses various aspects of trout fishing with Kev's original Old Salt character, The Phantom.
" I remain proud of this evolving piece. The completion and release of Tricking Texas Trout started me down a productive pathway, catapulting my creative energies. Feedback I received from readers about the ideas in the text played a big role in motivating me to create other products related to the sport of lure fishing for speckled trout.."
Price is $9.99, includes cost+tax+shipping. An informative Digital book, Productive Places and Patterns documents the locations and features of numerous spots where Captain Kev has caught fish, from Port Mansfield to Sabine Lake. In the 102 pages, the author also describes patterns he's used successfully in the areas. Ten Google Earth images are included to document some of the referenced sites. The digital book may be purchased using the PayPal button below. Captain Kev will reply to the payment and attach the PDF of the Digital Book. Price of $8.99 includes cost + tax. 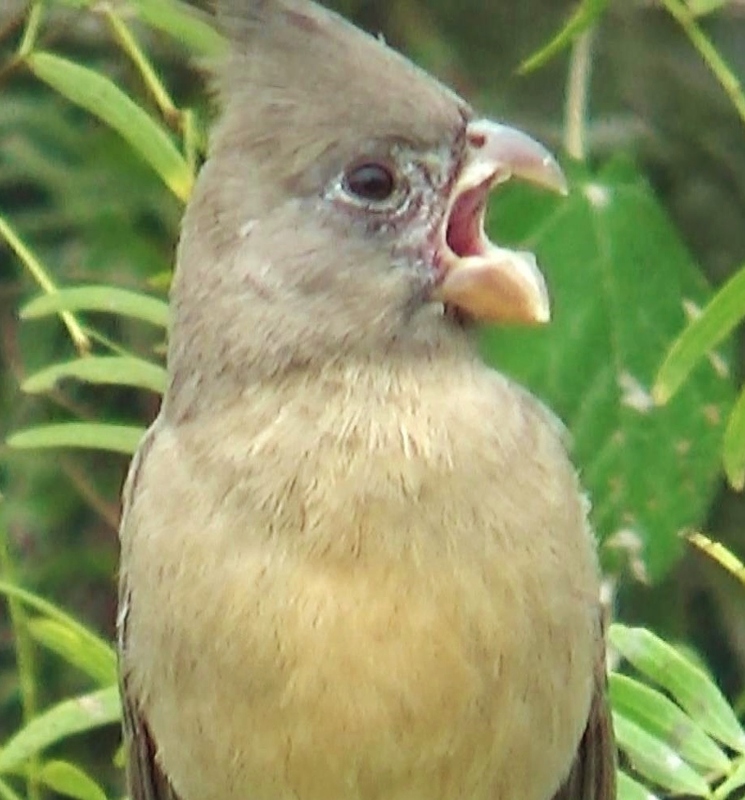 is a 90-page digital document which uses Google images, jpegs and text to pinpoint many of the exact locations where Captain Kev has found over 300 species of birds in various parts of South Texas, including places in Kleberg, Nueces, Jim Wells, Live Oak, Aransas and San Patricio Counties. Users can, of course, print the document, or just the pages they need, or use it almost like an app on the phone, to find primo places for birding, and maximize the productivity of their efforts, while out in the field. "I've included some famous sites, ones well known in the birding community, their excellence extensively documented on internet sources like eBird. When describing my habits and methods in those places, I've tried to make clear reference to parts of the sites where I've seen specific birds, and to strategies I've found useful in them. I've also created maps for areas with less known value in the birding community, documenting the roads and other spots where I've found birds within them." Price of $7.99 includes cost + tax.